TECHNOLOGY NO ONE WAS EVER WISE BY CHANCE. ​ Innovation is more than meets the eye at AXENT. The Group is wholly committed to creating a future where beautifully crafted products bring an unimagined level of quality to our lives. 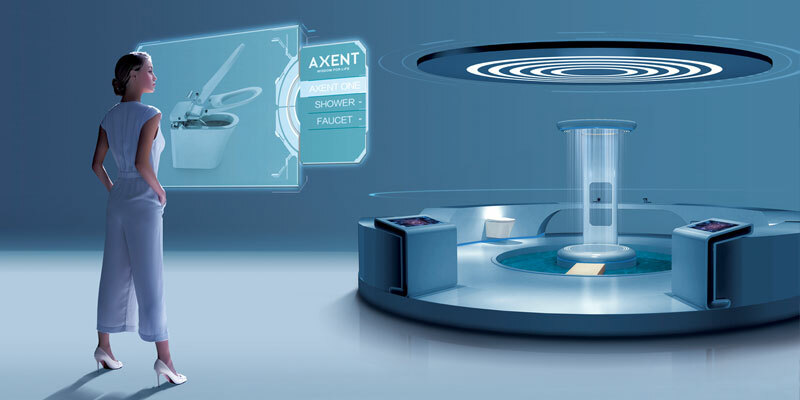 With 300 engineers in its research and development centre, alongside 1200 employees, the AXENT Group is well positioned to achieve its vision to become the world’s most innovative and reliable provider of sanitary technology. This award-winning shower toilet brings you all the luxury that technology has to offer. Slim design and features like a sensor hat recognizes you and automatically opens the toilet lid when you enter the room make for an unforgettable bathroom experience. AXENT.ONE C PLUS also features rear wash, front wash, warm-air dry, deodorization, night-light, VACUUM V FLUSH, our patented Easy Clean glaze, auto flush, a convenient remote control and seat heating. This toilet features 12” Rough-In dimension.